What is with the Logo? The logo is actually a mask worn by dancers while performing the Danza de los Viejitos (dance of the old men). 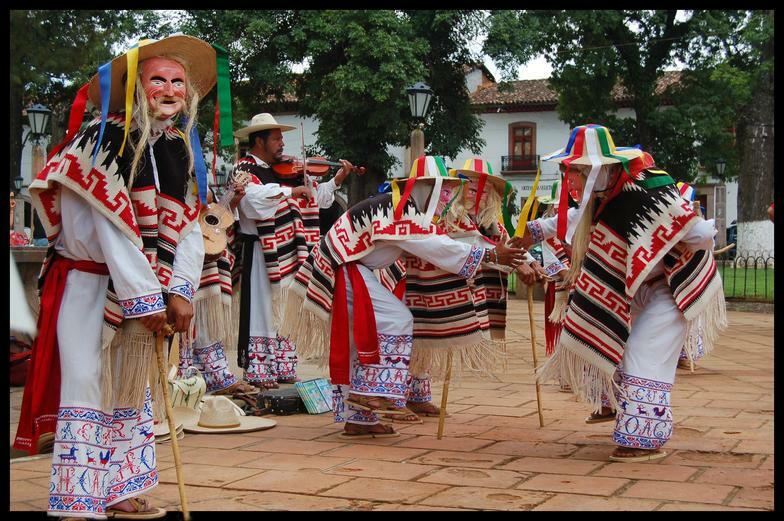 It is a humorous dance where performers wear masks of old people along with their typical campesino clothing. The dance starts out with aching and hunched over old men, with minimal movements. These movements turn into vigorous dancing combined with trembling and coughing and falling over by the “old men”. The dance has lost its original meaning, and has now come to represent the richness of life expressed in a dance. The Danza de los Viejitos originated in Patzcuaro and has since become the national dance of Michoacan. Two grilled pork chops smothered in a slow simmered Mexican salsa. Served with rice, beans, & tortillas. Cubed pork sauteed in Adovo (a mild red chile sauce). Served with rice, beans & tortillas. Marinated strips of beef or chicken, grilled with bell pepper & onion. Served with guacamole, pico de gallo, sour cream, cheese and tortillas. Slow simmered pork, marinated in special spices. 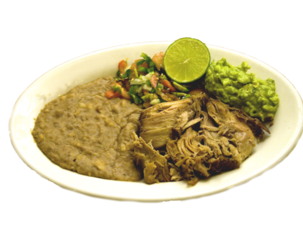 Served with pico de gallo, guacamole, beans & tortillas. Three jack cheese enchiladas smothered with a mild red chile sauce and cheese. Served with rice & beans. Three fried eggs smothered with green chile. Served with rice, beans & tortillas. Three Eggs scrambled with homemade Mexican sausage. Shrimp sauteed in olive oil, garlic & lime juice. Served with rice, lettuce, tomato, & tortillas. Fish filet sauteed in olive oil smothered with a slow simmered Salsa Mexicana. Served with rice, lettuce, tomato, & tortillas. 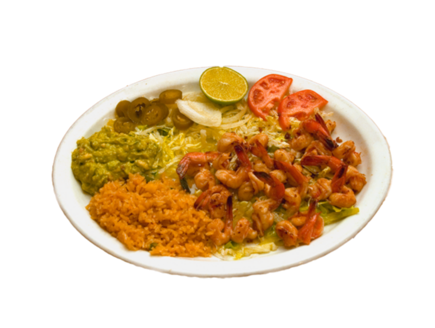 Shrimp sauteed in olive oil smothered with a slow simmered Salsa Mexicana. Served with rice, lettuce, tomato, & tortillas. Fish filet sauteed in olive oil, garlic & lime juice. Served with rice, lettuce, tomato, & tortillas. 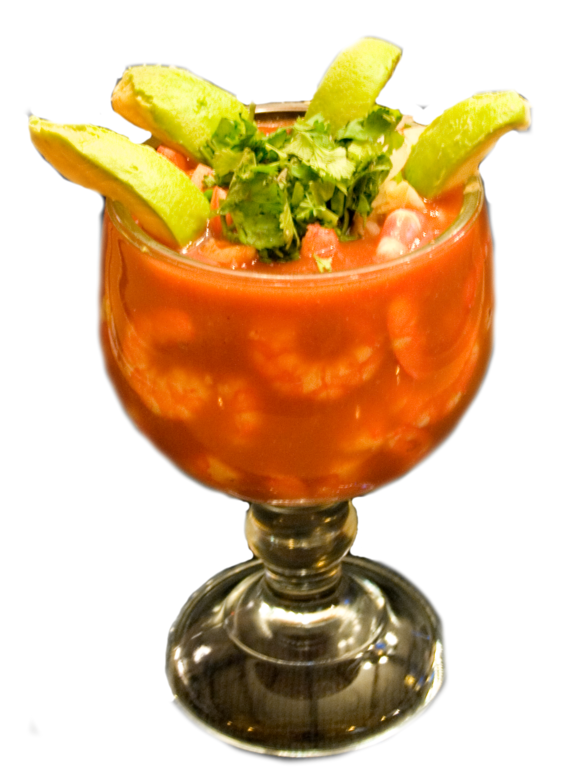 Shrimp cocktail topped with diced onion,jalapeno, cilantro, & avocado slices. Served with crackers. (4) steak grilled with onion & tomato. (4) Grilled strips of steak. (4) Pork marinated in adovo (mild red sauce). 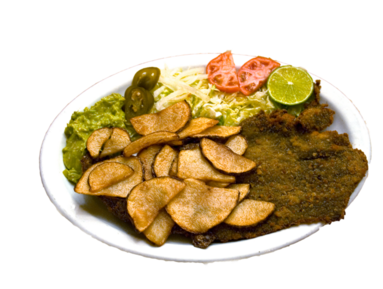 Chile Relleno, Milanesa, Carnitas, or Huevo Con Chorizo. A Mexican sandwich with lettuce, tomato, onion, jalapeno, & guacamole. Beef stew served with rice & tortillas. Tripe soup. Served Saturday and Sunday only. All tostadas served with lettuce, tomato, & cheese. Please only one check per table all substitutions at least $.50 extra 18% gratuity added to all parties of six or more. Beef Strips grilled with onion and tomato then smothered with green chile. 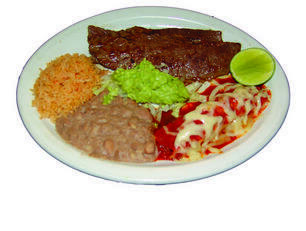 Served with rice, beans and tortillas.